I've been thinking very heavily about the conversation that I had with my geometry students on Monday. They are, in my mind, overly concerned with getting into college, to exclusion of all else, including the actual act of "learning." I expressed my discomfort with this notion on Twitter and had a very interesting conversation about teaching and parenting with Kory Graham. @JustinAion It's hard. I always want more for them, just need to realize their more might not look the same as mine. Such a fine line. How do I help my students? How do I help my own daughters? I think this is part of a much larger discussion about how we as teacher define success versus how the parents of our students do versus how the students themselves do. A few weeks ago, I was asked for my opinions about Common Core and standardized testing by a reporter from the New York Times. One of the things that I told her was that I don't see how, effective or not, standardized tests can even be designed until we have a national, or state, or local conversation about the basic question of the purpose of education. My thoughts on those are constantly shifting, which is why I have discomfort with my current assessment and grading practices. I'd like to write more about this, but my head isn't on straight at this point, so I'll talk about my classes instead. My pre-algebra student demonstrated proficiency with calculator use, about which I have mixed feelings. We are working with fractions, fraction to decimal conversion, and ordering rational numbers. I've been giving my students to the opportunity to do some independent work, but I think today may be the last day for that. 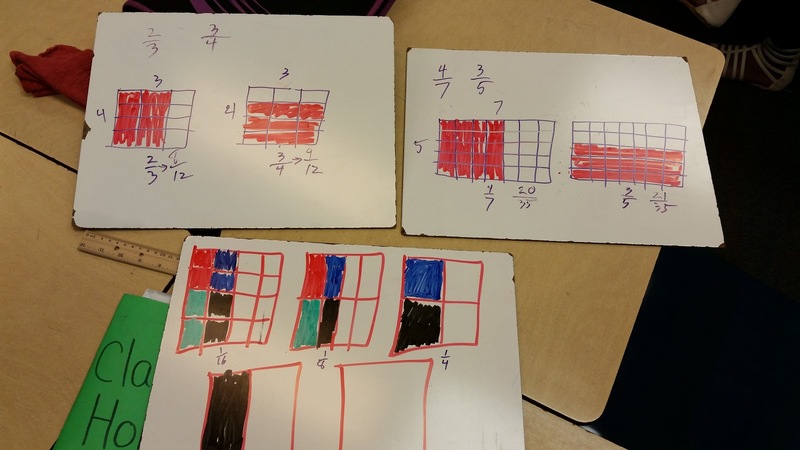 The advantage was that I was able to sit with a few students and talk about ordering fractions. As is the case with much of my brilliant lessons, I channeled Fawn Nguyen. I plan to spend the next week (month, year) talking about fractions in terms of rectangles. As I was working with my students about how to compare 4/7 and 3/5, one of the girls started talking about how she learned to compare fractions from a previous teacher. Her explanation included phrases like "since the denominators are both odd" and "then you add the top numbers." At that point, my eye was twitching so heavily that they had to call the nurse. I should also state that, had she been able to solve the problem using this method, I would have been more likely to listen and try to figure it out, but she couldn't. Not only couldn't she solve the problem, but she admitted that the process didn't make any sense. So we talked about rectangles. We did it slowly. It was a conversation, rather than a lecture. They took great notes and asked great questions. Perhaps most encouraging of all was what one of them said. "I really feel like I learned something today." I''ll admit that I've been lost for the last several days, feeling as though I was killing time and watching unproductive struggles. I think this could be a bit of interest that I can leverage into a more productive discussion of fractions.